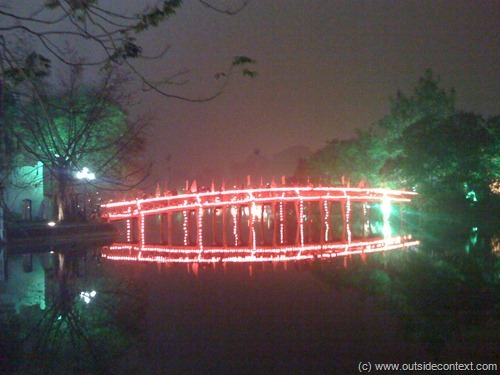 Hanoi, Halong Bay and Tet New Year – Part Three! The travel blogging is back! Note: This is the third part of a complete three part article that completes our time in Vietnam. 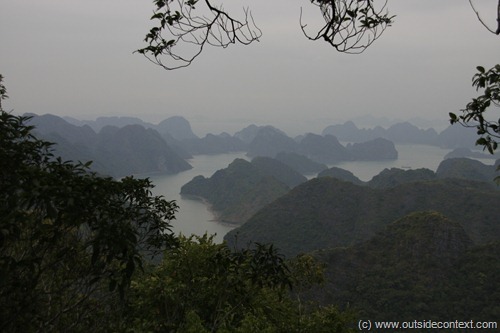 This entry continues our adventures in Halong Bay and the wonder that is Tet in Hanoi. The next day we were taken to a large island and dropped off. There we were given a bike each. These were frankly terrible bikes and I got the distinct impression that that staff did not expect us to ride them. They expected us to pay for a moped instead. An older couple from our group did so, but Cesca and I insisted on riding and so set off. The chain fell off immediately, so Cesca changed her bike and we set off. The wheels locked immediately, so Cesca changed her bike again and we set off. The seat fell off immediately, so Cesca took my bike, I got another one, and we set off. I thought this was a bit rich since it was his company’s responsibility to provision local services. Since he had so much of our money (about $2000 paid by the entire boat), one would think one of the locals could be trained as a bike mechanic. 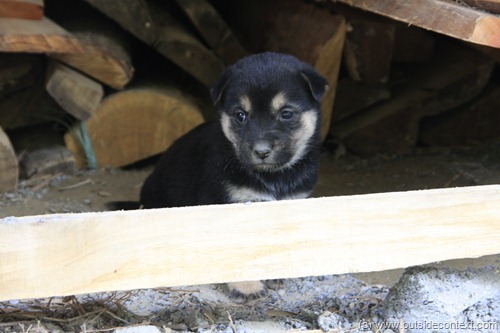 I suppose he was trying to make me feel guilty, but unfortunately for him I had already been to Laos. Those people had nothing. These people were relatively rich. We rode through the mountain pass and down into the next valley. This was your absolute picture perfect Vietnamese countryside. Rice paddies, buffalo and villages set against the majestic mountains. Eagles soared overhead. The problems with the bikes were quickly forgotten. We rode through the village and smiled a hello to all we met. This was much more like it. After about 5 miles or so, we stopped at a little cafe and bought some drinks, and then the guide led us to the walk. It was clear to me that most of the time people do not actually fancy the walk, as it was straight up the mountain on a dirt track. However, this time he had not only Cesca and I, but also a guy from the Italian mountains. He walked up the thing, back down, met us half way and back up again all without breaking breath. By the time we reached the peak (about an hour later), the three of us (plus guide) were the only ones who had bothered to make it. At the top was an old base left over from the war, which afforded incredible views of the valley on either side and the water all around with the peaks of islands in the distance. It was one hell of a view. We walked down again and stopped for refreshment. There I met another English couple who were about to go home. They too had got to wondering what their trip was all about and bemoaning the fact that they felt exactly the same as before they left. Don’t worry, I told them, it will come to you at home. Epiphanies are not always of the order of magnitude you expect. Not everyone can have the flashing burst of the infinite that struck Jesus or Buddha, some get lots of little ones, some get none. Perhaps they are something you must not look for. Perhaps they are why we climb mountains and travel countries. Personally, I get a little one every single time I cuddle up to Cesca in bed. That is good enough for me. Anyway, I had a big one about 12 years ago in Israel. Still, we jumped back on the bikes and rode out the way we came in. Back on the boat, we were taken for one last jaunt, to Monkey Island. As we arrived, our group, which was by now getting on well, passed around some whisky and I read the Lonely Planet description about Monkey Island. I read it again aloud and everyone voted to give it a miss. Monkey Island is unsurprisingly full of monkeys that, also unsurprisingly, have developed a hatred for humans, not that I can say that I blame them. Subsequently they often attack them, and some have rabies. Instead, the boat took us to a local floating village comprised of a couple of shacks, some barrels and a lot of nets. There we met with a clam farmer who uses an amazingly clever way of farming clams using buckets of mud suspended under water. This was the most genuine experience of the entire venture and the one that we all enjoyed. The farmer was friendly and we joined him for a toast of the local firewater outside his shack. The inside the shack sat his children and they obviously all live in this strange place. I think, it is quite possible the strangest lifestyle I have ever come across. At once so remote and harsh, and yet he gets tourists popping in all the time. After half an hour of nodding and smiling, but no actual conversation, we got back on the boat and made for the final island. Cat Ba Island is much larger than the rest and has a lot of building going on it. I suppose the idea is to turn it into a holiday resort, but now it is a bit of a concrete jungle amid a building site. We jumped into transports and were whisked to a hotel. This was purporting to be the Vietnamese idea of a high quality hotel, but I spied that it was really another type of tourist trap. That night we all met up for a set meal and some very expensive drinks. The food was ok, nothing special, but I really enjoyed the company as by this time we were all getting on in that peculiar British way of connecting when stuck with each other. We slept comfortably that night. The next day, after a breakfast, we headed back towards the city. About half way, we stopped at a restaurant for lunch. This also had something strange about it, as although it was nice and the food ok, I could not escape the feeling that only tourist busses come here. For people like Cesca and I, used to the genuine experience, such sugar coated tourism felt wrong and unnatural, but still the view from the window was great. We bid the others goodbye when we arrived back in Hanoi and re-entered our original hotel. The staff was not pleased to see us at all. In fact, they told us that we could not stay. After I pointed out that we had already paid to stay, they got a little agitated. Eventually, they went over the road and organised for us to move hotels. This turned out to be a great idea as the staff at this second hotel, the service, the room and the food, was the best I had in the whole of South East Asia. Friendly, quick, polite and happy these people made us feel right at home. In the room, Cesca was still steaming about the other hotel. I personally think that the staff had made plans to close the place during the coming New Year, and we were totally buggering them up. Still, rudeness, the most unforgivable trait in a hotel concierge, was painful. 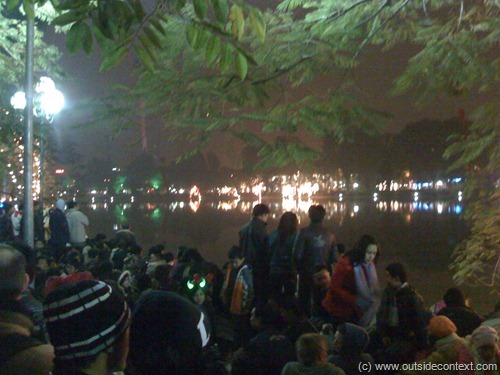 That night was the first day of Tet and effectively the Vietnamese New Year. Our hotel manager explained what that meant. Tet is the celebration of many things all rolled into one. 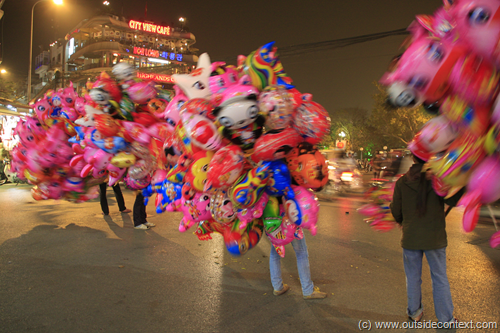 The traditional Tet is the New Year, which means, like in the UK, that the year ticks over by one. However, unlike in the western world, it is also everyone’s official birthday. Therefore, someone 29 today would be 30 tomorrow. Someone born today would be one tomorrow. Crazy as that sounds, it gives rise to the third phenomenon: Tet is also Xmas. Of course, the Vietnamese are not a Christian nation, rather they are Buddhist, but Tet affords all the practical actions over a British Christmas. Firstly, everyone takes as much of the week off as they can, they also go to visit their families for that time. They have a special social practice around this, where on the first day of Tet, only the direct family are invited, then on the second day wider family, the third day, neighbours, and so on. It is very easy for foreigner to cause offense in such an environment and if you are invited on a certain day, you must never appear beforehand. You are seriously warned about this. Secondly, everyone buys each other presents. Thirdly, they all surround themselves with a special tree. Rather than the Norwegian fir tree used in the west, they use a peach or orange tree. The entire city was decked out in beautiful fruit trees all around. It was rather magical. Looking at it from his viewpoint it is not hard to comment that Vietnamese Tet has everything in common with the average UK Christmas; religion enters into it in only small and controlled amounts, while superstition is rife. Also worth remembering is that Tet is the anniversary of the Tet offensive against the Yanks. The Vietnamese feel very strongly that the thousands slaughtered in the ensuing battles died as heroes, every single one. Amazing and even now the strength of feeling still moves me. The final thing that happens is that the City empties in the run up to Tet and then everyone comes out for the fireworks party. Cesca and I spent the day exploring the area set aside for the party and planning our night’s activities. We had a lot of fun playing in the strangely silent roads, possibly for the only time in the year that they are empty. For a country such as Vietnam, where everyone – absolutely everyone – has a moped, this was a surreal experience. As the night came down, the city stirred and we went in search of food. On the way we bumped into a few people we knew and shared a hearty “Chuc mung nam moi!” which is the cry of Tet. We eventually found a very special place to hold up awaiting the action coming later, this was a great bar above a street and one of the few place still open. Most were either eating in roadside food cafe’s, a sort of selection of crates used as chairs and planks of wood as tables – fear not as the food is amazing at these places, or they were ensconced in the higher end bars that charged Western high prices. We managed to find something in between and had a very romantic time. 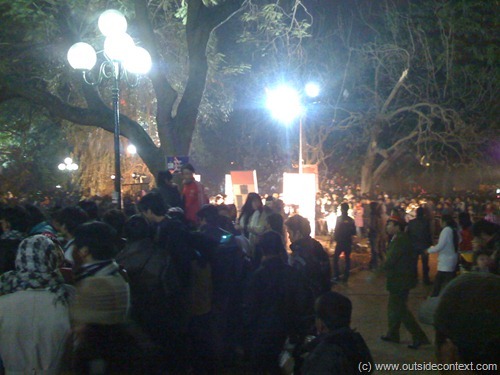 As the hour approached, we made our way down to the lake, which by now was stacked with people. Our worry about being unwelcome at such event vanished as the Vietnamese seemed to adopt all the foreigners that night, everyone was happy and smiling, all had brought their families out to enjoy the event, it was a wonderful feeling to be so welcomed at such an event and lots of smiling shouts of, “Chuck Mung Nam Moi!” reached our ears from all directions. The crowd closed in and the numbers welled to thousands. Now everyone was standing. Cesca and I could see over the sea of heads that they were awaiting something. 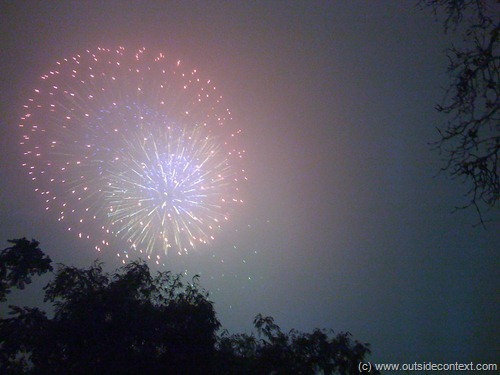 We worried for a moment that the trees lining the lakes edge would block the view of the festivities, but then the fireworks started and banished those fears. I have seen fireworks all over the world, In Disneyland Florida, in the seaside coastal town of Brixham, in Australia, in Cambodia, in Brazil and even in Israel, but the fireworks I saw that night were as good if not better than any of them. 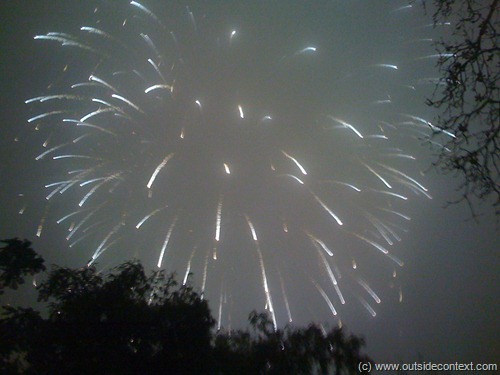 The Vietnamese welcomed in the New Year, their new ages and honoured their dead with one hell of a bang. After almost an hour, the last explosion lit up the sky and the crowd started to move in one direction. It seemed that some sort of temple ceremony was now happening and the idea was to visit the temples in a certain order. Cesca and I joined in and were carried along amongst the happy fellows. Many hours later, we managed to arrive back to the hotel. There we found that the manager was having her family event right there in the lobby. With great joy she bid us to join, and greatly honoured, we did. I hope it brought her luck. We ate the traditional cakes and drank a little before thanking her and heading to a well-deserved bed. A day later, we were leaving Hanoi and Vietnam in general and I took stock of what he had experienced. The people of Vietnam are a pragmatic and hard working bunch. Their economy is trying to copy the successes of the western while avoiding the problems, at least for now. Their cities are rich and impressive and they have a very positive attitude. They love visitors, but do not love tourists and in that I agree wholeheartedly with them. They cater to tourism out of the fundamental need to enrich themselves. Their cooking is divine, their beer is fine and their women are very good looking. We had seen the most sugar coated sights and yet had also managed to peek a little into the truth under these illusions. There was so much more to explore here that I felt that we could be back one day and see the rest. I loved Vietnam. The country that, more than any other, I got “wrong” in my preconceptions. It has to be seen and felt with the heart itself as, like the brochures for Halong Bay, pictures alone cannot do it justice. Coming next: Coming in the next article is the mighty city of Bangkok, an incredible meet-up with some old friends and the horror of the Bridge On River Kwai, where Basho comes face to fangs with an eight inch spider.